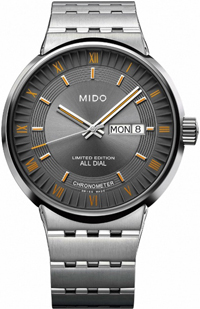 New Watches All Dial 10th Anniversary of Mido in honor of Rome. Swiss watchmaker Mido announced a new model wristwatch All Dial 10th Anniversary. Swiss watchmaker Mido announced a new model wristwatch All Dial 10th Anniversary. Although the new title does not even hint at the capital of modern Italy – Rome, the new hours are devoted to him – the Eternal City. The round building new 42 mm made of stainless steel. The face of the casing, waterproof to 100 meters, is equipped with anti-reflective sapphire crystal. On the back cover is engraved with the famous model of an architectural monument of Rome – the Colosseum. Model All Dial 10th Anniversary operates on the basis of an automatic mechanism ETA 2836-2 Swiss production. The unique size of 25 stones, which provides 38-hour power reserve and frequency balance 28,000 vibrations per hour, equipped with a spring balance Anachron, the balance wheel Glucydur, spring Nivaflex M. and shockproof system Incabloc. The mechanism adorned with Cotes de Geneve pattern on the rotor, COSC certified as a chronometer. Caliber blued screws. The functions of the mechanism is the display hours, minutes, seconds, date and day of the week. Gorgeous face executed in exquisite colors of dark gray and orange. At the periphery of the dial is decorated with a convex pattern, and the center is decorated circular pattern. Time on the dial is indexed by the central hands, covered with fluorescent orange-colored coating. Sam graduated orange dial with Roman numerals and index hour patch. At the 3:00 position is located square aperture of the date and day of week. Model All Dial 10th Anniversary comes in an elegant stainless steel bracelet. Production is limited to the hours of 1000 copies, but if you decide to become the owner of this luxurious trehstrelochnika, then buys a watch All Dial 10th Anniversary will be at the official representatives of Mido.